These three systems represent the next generation of Marine Corps air command and control capabilities: connecting Marine Corps units and their operating picture with the Navy’s, sending and receiving data in real time, and detecting more types of incoming threats to Marine Corps ground units. In total, according to some of the first Marines in the force to work with this new trio of systems, the combination of the radar, command and control system and network will help the Marines be more mobile, save lives on the ground, and extend the range of Navy land-attack weapons at sea. Marine Air Control Squadron 2 (MACS-2) Marines recently took time out of their test schedule to show USNI News their new gear and explain how the fielding of these new systems will change how they operate. The most recent addition to MACS-2 is the Ground/Air Task Oriented Radar (G/ATOR). The radar spent May and June of this year in testing at NASA’s Wallops Flight Facility on the eastern shore of Virginia, revalidating that it met all the system requirements and was interoperable with the Composite Tracking Network (CTN). 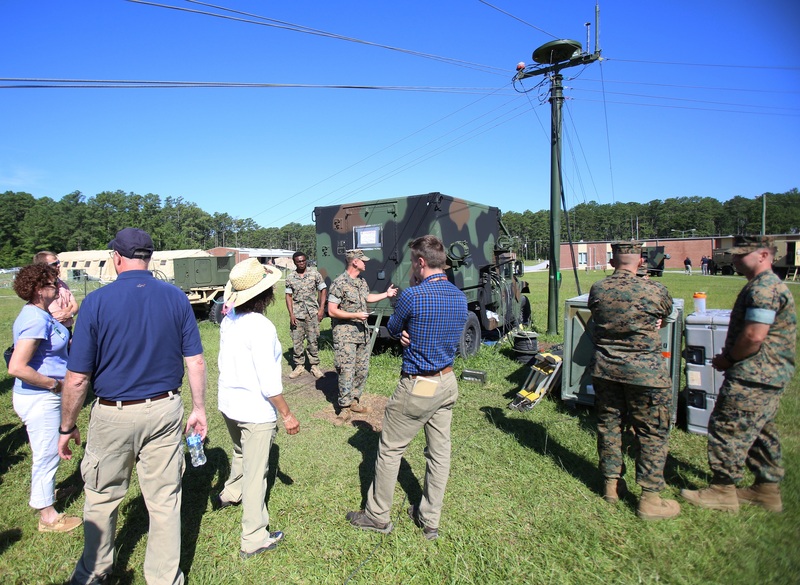 Ahead of more extensive testing at MCAS Cherry Point’s Atlantic Field, the radar stopped by the main base for demonstration and interoperability testing with the other new addition for MACS-2, the Common Aviation Command and Control System (CAC2S) Phase 2 package. CAC2S Phase 2 arrived at MCAS Cherry Point in May, when MACS-2 Marines started new equipment training on the system. With that training phase now complete, MACS-2 has the distinction of being the first unit in the Marine Corps to complete the transition to the newest gear – their West Coast counterparts, MACS-1 at MCAS Yuma, Ariz., followed about two weeks behind. The command and control system is housed within a shellback Humvee and connects to computers in a tent, all of which can be torn down, moved and set back up faster than its predecessor and without requiring heavy trucks. 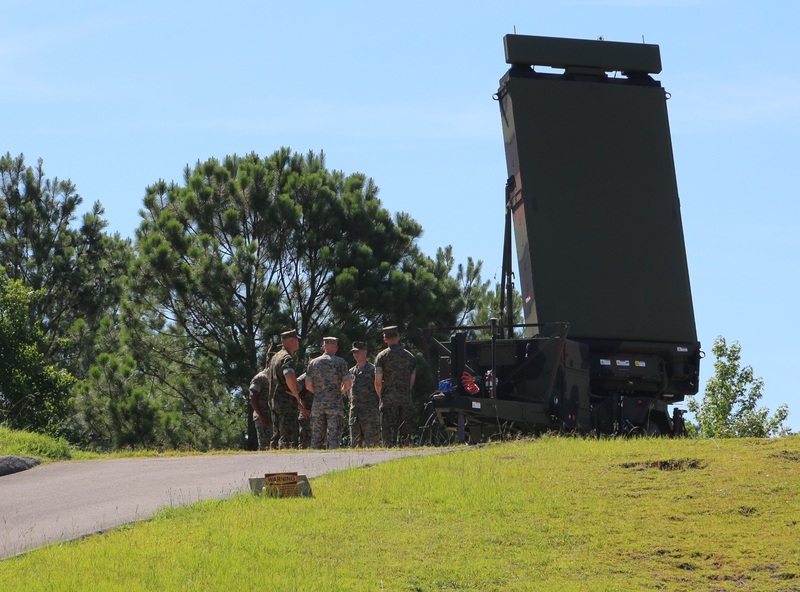 The Ground/Air Task Oriented Radar (G/ATOR), photographed, and its air defense capability is conducting a demonstration with the Common Aviation Command and Control System (CAC2S) Phase 2 at Marine Corps Air Station Cherry Point before heading to another test site for advanced testing, leading up to initial operational capability being declared in early 2018. US Marine Corps photo. Each of the pieces of gear does something its predecessor could not. G/ATOR can track more sophisticated tracks of incoming air threats, and can even see some small and low-flying threats that older radars couldn’t see at all, such as unmanned aerial vehicles or cruise missiles. CAC2S Phase 2 processes the operators’ commands significantly faster – Sgt. Joshua Holden, a tactical air defense controller with MACS-2, told USNI News the old system could take 30 to 45 seconds to process the functions operators typed in, whereas CAC2S Phase 2 responds in just two to four seconds. And CTN – the Marines’ version of the Navy’s Cooperative Engagement Capability (CEC) – allows real-time data transfer, compared to the lag found with other networks like Link-16, which MACS-2 air defense control officer Capt. David Haber-Mattie told USNI News is the difference between the data simply being able to inform situational awareness versus being current enough to be fire control-quality data that can guide weapons. Haber-Mattie, Holden, and radar technician Cpl. Joshua Gagne explained to USNI News that all these upgrades can save money, save time and save lives. For one, Haber-Mattie said, the G/ATOR can see more types of threats. “It allows us to really see those threats that the [legacy AN/TPS-63 radar] probably would not have seen, maybe the [AN/TPS-59] wouldn’t pick up either – but it would be those low-flying threats or very small threats like a UAV (unmanned aerial vehicle) or even maybe like a cruise missile that we wouldn’t normally see,” he said. The Composite Tracking Network requires line-of-sight connections achieved through an antenna transported via truck. US Marine Corps photo. That faster transfer of data also means the G/ATOR, CAC2S and CTN combo can help guide weapons shot by Navy ships at sea, since the real-time data transfer creates fire control-quality data. “The CTN allows the Marine Corps to utilize its organic radar systems to integrate with other assets such as an E-2 Hawkeye or Navy ships that are out in the water. That allows us to increase their range – say a Navy ship, increase its range from the water over land,” Haber-Mattie said. As a result, if the MACS-2 Marines spotted a target inland that was too big for their ground units to take on, they could direct a Marine Corps or Navy airplane or a Navy ship at sea to take out the target with a larger weapon, guiding that weapon all the while with real-time information from G/ATOR via CAC2S Phase 2 and CTN. Another benefit of the new systems the Marines spoke of was mobility. Holden said the legacy command and control system included a lot of heavy and bulky gear that took a day to move – which meant the Marines typically didn’t move unless they absolutely needed to. With changes to the threats they face, he said the mobility of the new CAC2S Phase 2 is itself a potential life-saver. The mobility of the system is so great that it is actually changing how the Marine Corps plans to use its air command and control units. Holden and Haber-Mattie said the Marines could easily move the CAC2S, G/ATOR and CTN trio if a mountain were blocking line of sight communication, if an enemy spotted their location or if the war shifted and they needed to move along with the action. Gagne, the G/ATOR maintainer, said the radar is so easily moveable – the radar takes only 30 minutes to set up, compared to the couple hours it would take to set up CAC2S Phase 2 in a new location, and the full day it would take to move the legacy gear – that the G/ATOR operators can actually take requests from pilots or Marine ground units to move into view of otherwise hidden areas and fill in the operating picture. For the tactical air operations centers (TAOC) and early warning and control sites (EWC) – other echelons of units that will be using these three new systems – Gagne said their mission will evolve around G/ATOR’s capabilities. “Since we’re so mobile, we’ll be able to employ our gap-filler radar in different ways than we were able to before,” he said. “As the mission progresses, since we are so mobile, any time there’s a gap in coverage, let’s say maybe they want to see behind a mountain, we can get that coverage in the time it takes to just get the radar there essentially, since it only takes us half an hour (to set up) – it doesn’t take us days to get there, we can move multiple times in one day,” Gagne said. 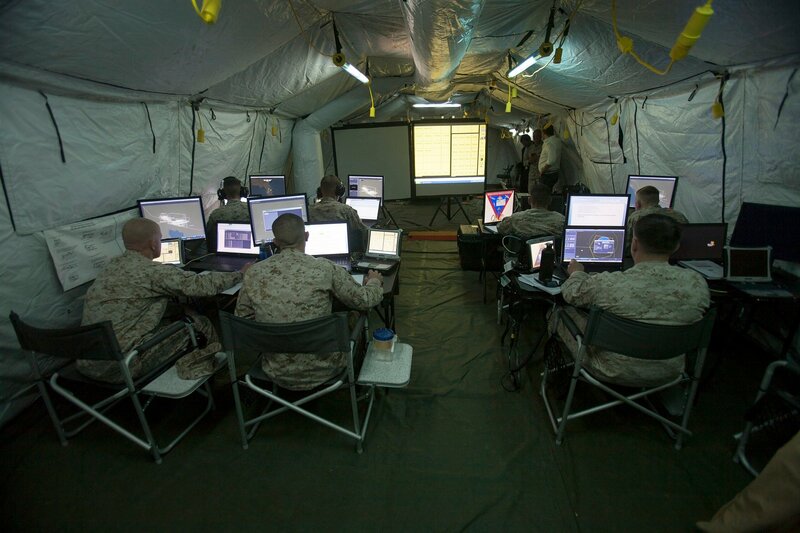 The Common Aviation Command and Control System (CAC2S) consists of computers in a tent for operators to use, connected to the main computing system housed within a shellback Humvee. US Marine Corps photo. Haber-Mattie said the CAC2S and G/ATOR combination was so mobile, in fact, that one day it might be able to deploy with a Marine Expeditionary Unit aboard Navy amphibious ships, giving the air control community access to places the Air Force or other agencies could never get to. G/ATOR’s Block 1, which includes the air defense and air surveillance mission being used by MACS-2 Marines today, will go through an operational assessment led by Marine Corps Operational Test and Evaluation Activity this year, and Marine Corps leadership are expected to declare initial operational capability (IOC) around February 2018, USNI News previously reported. On the CAC2S side, program manager Col. Don Gordon told USNI News this week that the Marines have already bought the first nine CAC2S Phase 2 systems, both the hardware and software, through a low-rate initial production contract with General Dynamics. Seven of those systems are being fielded this year with MACS-2 at MCAS Cherry Point; MACS-1 at MCAS Yuma; Marine Air Control Group-38, Marine Tactical Air Command Squadron-38, and a small early warning and control site at MCAS Miramar; and at the schoolhouse at Marine Corps Air Ground Combat Center Twentynine Palms. In January or February of 2018, the remaining two systems will go to Okinawa, Japan, with Marine Air Control Group-18. Gordon said his program office is also getting ready to award a contract in late August for full-rate production of the remaining hardware systems and for software sustainment for all of CAC2S Phase 2. On the hardware side, that contract will cover the remaining 41 CAC2S Phase 2 systems, which will replace the CAC2S Phase 1 hardware – a partial capability that was fielded early but cannot connect to G/ATOR and CTN, among other capabilities it lacks compared to the full Phase 2 upgrade – and other legacy command and control systems. On the software side, Gordon said the Marine Corps intends to update the system’s software four times a year through this contract. Upgrades will include patches to address cybersecurity concerns, as well as fixes if any problems are identified and additional capabilities that Marines may find themselves in need of. Cpl. 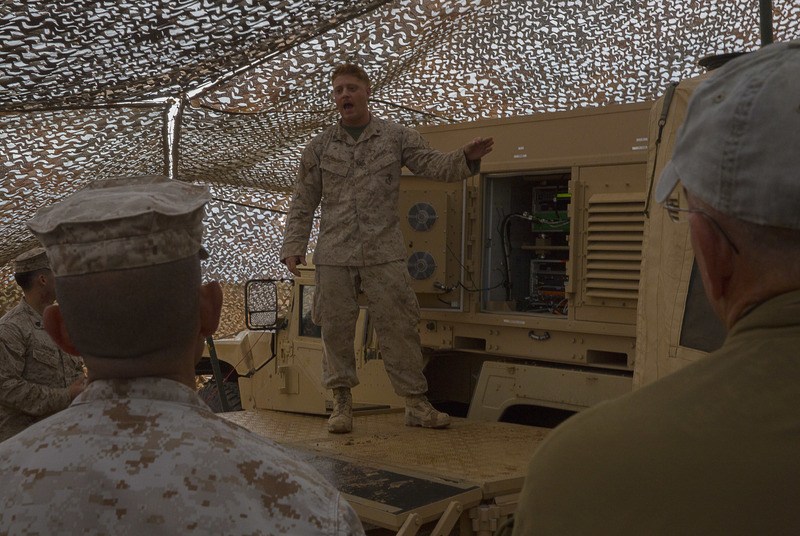 Elijah Schellhardt, a Marine Corps Tactical Systems Support Activity Common Aviation Command Control System (CAC2S) support team member shows visiting VIPs the shellback Humvee used to house the CAC2S Phase 2 servers at the Stoval Auxiliary Airfield, on Marine Corps Air Station Yuma, Ariz., Oct. 8, 2016. 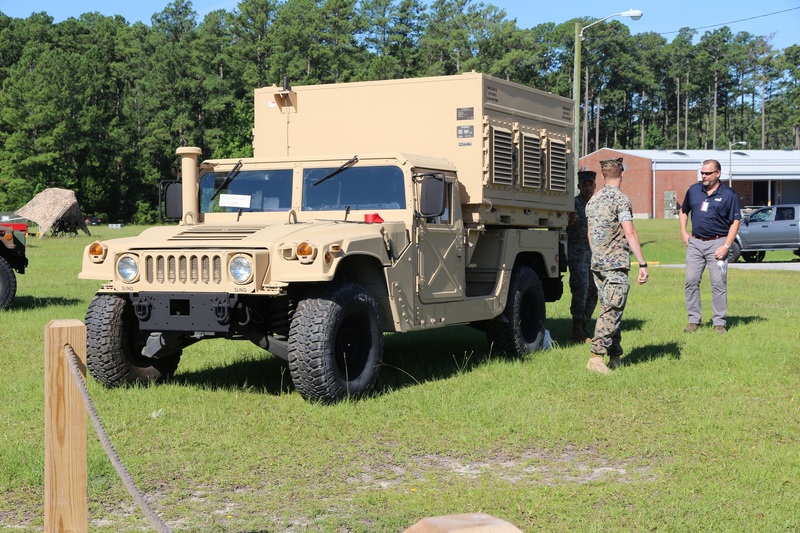 The shellback Humvee concept provides superior system mobility over the traditional use of large trucks for transport of the aging Marine Air Command and Control System CAC2S is slated to replace. US Marine Corps photo. As the 50 total CAC2S Phase 2 systems are fielded throughout the Marine Corps, they will start at the lower-level Marine Air Control Squadrons – like the MACS-2 Marines at MCAS Cherry Point – and will later be fielded at higher echelons to support operations out of tactical air operations centers, direct air support centers and tactical air command centers. Some of the systems will be smaller – the one delivered to MACS-2 can accommodate about 16 operators at a time, Gordon said – whereas the ones delivered to support a tactical air command center, where a wing commanding general and his or her staff would operate from and perform battle management for air operations, can fit more than 10 times as many operators.